Whilst many in the Boston area were enjoying yesterday's victory parade, I was mourning the loss of my beloved willow tree. 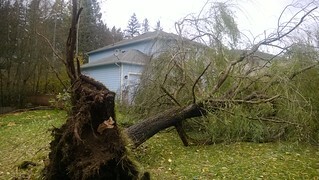 We had a wind storm (a somewhat common occurrence here in the Pacific Northwest), and it just knocked our beautiful tree over. Luckily, it didn't hit our house, our neighbors house, or the car. This did mean, however, that I would not be spending my Saturday following the parade on TV, watching massive episodes of my new-found love, Supernatural, or anything else fun or relaxing. Also luckily, J.R. and I've got some awesome friends who came over to help with the work of clearing the driveway and removing enough of the tree to make our lives livable until we can get a professional out to take it all away. Anyway, yesterday's parade reminded me of how happy I was during the 2004 parade, and also how wet. Yesterday, I was quite wet, as well, but not nearly as happy. I was wondering whether your sports allegiances have changed since you moved west. Still rooting for the Patriots, too? But of course! I just tend to write less about it -- which is probably fine by the rest of the interwebs.